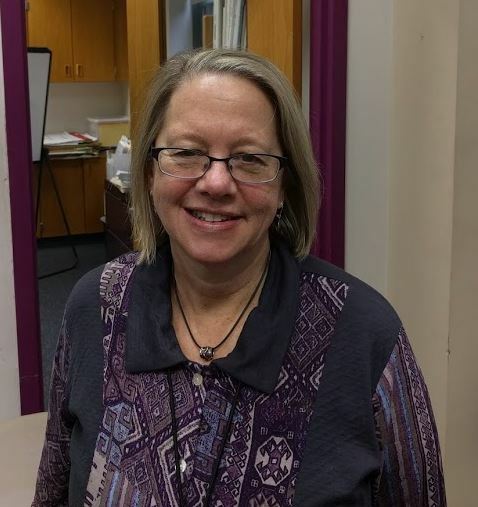 Amherst Regional High School’s head librarian, Leslie Lomasson, recently found out she won the Peggy Hallisey Lifetime Achievement Award, just a few months before her retirement. “It was an unexpected honor,” Ms. Lomasson said. The Massachusetts School Librarian Association award honors a member’s lifetime contributions to the profession of school librarianship during the course of their 10 or more year career. The member must demonstrate exemplary commitment to the services of students, 21st century learning, and the advancement of school libraries. Ms. Lomasson has been the school’s librarian for the past 12 years. She’s technically “the [library’s] faculty member,” she explained, who oversees “all aspects of the library” and works closely with para-librarians Annie Figliola and Kenny Ramos. Along with being the school librarian, Ms. Lomasson is an area director of the Massachusetts School Librarian Association (MSLA), which promotes school librarian leadership and school library programs. The MSLA provides resources, instruction, and opportunities for collaboration that optimizes student learning. One way she did this was to create the school library’s website, which gave the library its ability for digital access, expanding student access to the library’s resources such as books, magazines, and ebooks. She collaborates with faculty by teaching and learning and by helping to teach classes on how to use the library tools such as information acquisition and evaluation. For the health and social studies departments’ research and writing projects, Ms. Lomasson teaches information literacy (which focuses on learning the skills to conduct good research), through the aid of available resources on the library’s website. Last year, the library received a financial gift which they decided to use to make the school library a nicer physical space for students and staff. Ms. Lomasson visited other libraries for input, negotiated with vendors, and evaluated the library’s inventory. She also reached out for student feedback about the library’s redesign through a student survey and committee. Shelves in the library were dismantled to make room for a new counter with USB outlets and a new seating area for students and faculty. The chairs and benches in the library were replaced. The area that once had square benches with no back support were replaced with bright blue, semi-circular benches with back support. Also, due to the dismantling of a few bookshelves, the orientation of the library’s books was rearranged. She explained that Ms. Figliola oversees the support on the floor by supervising student volunteers, pulling books for class units, setting up displays in front of the library, and cataloging books, and that Mr. Ramos is in charge of front desk activities, including circulation, statistics, and cataloging new books. After 12 years as an ARHS librarian and MSLA member, and now an award-winning one, Ms. Lomasson will retire at the end of this year.